Here’s a new perk for Toronto apartment renters: Watch your pup frolic on the terrace while sipping a cocktail and enjoying a movie on a 75-inch flat screen TV in the building’s plush cinema room. 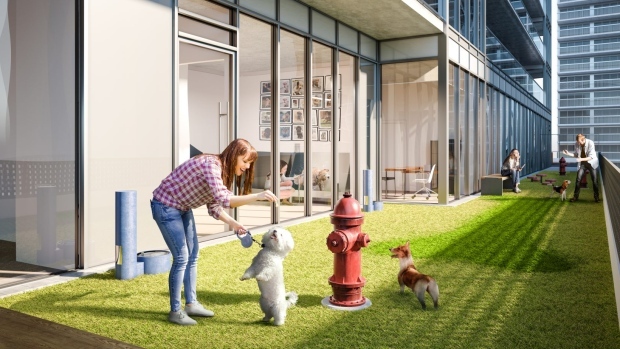 The ‘bark park’ is just one of the luxuries on offer at a new downtown apartment building designed to feed the city’s rental frenzy. ‘The Livmore,’ a 43-storey, 595-unit apartment at the corner of Bay and Gerrard Streets cost owners GWL Realty Advisors Inc. more than US$200 million to develop. Toronto’s rental market is going upscale to meet surging demand from millennials and downsizing baby boomers who want a little more than your average walkup while providing a steady income stream for institutions such as pension funds. After years of drought in the purpose-built rental market, builders are in overdrive and rents are soaring. Rental units under construction jumped 69 per cent to 11,073 in the Toronto region in the second quarter from the same period a year earlier, according to data released Thursday from researcher Urbanation. That’s the highest in at least 30 years. With vacancy rates of just 0.3 per cent in the purpose-built segment, rents soared 11 per cent to an average of $2.97 per square foot for available units, Urbanation said. The average price of a condo was $561,097 in June, while monthly rents for condos increased to $2,302 over the year. In addition to GWL Realty, which manages institutional money, Tricon Capital Group Inc. is investing about $1.3 billion in a development pipeline of 2,700 apartment rental units in Toronto. Cadillac Fairview Corp., a unit of the Ontario Teachers’ Pension Plan Board. is also exploring rentals. They’re being enticed by new funding and lending initiatives from the Canada Mortgage & Housing Corp. which will provide up to $3.75 billion in low-cost loans from 2017 to 2021 to encourage construction of apartment projects across the country. “The rental market’s got a lot of legs to it still. Most of our projects going forward are rentals instead of condos,” Rick Iafelice, president of Main and Main Developments, said in a phone interview. The company is building a mixed-use project with retail space and 330 apartments in Toronto that will cost about $150 million. Livmore, which has been open for rentals for about 45 days, is already more than 20 per cent full, beating its Sept. 1 schedule, when the first phase of occupancy is slated. Rents for studios have jumped to about $1,889 per month from $1,600 while one-bedrooms are fetching $2,300, said Nishimura. The priciest units are two-story, three-bedroom suites that go for $10,000 a month. Tricon is also adding condo-like amenities such as a spa, outdoor pool, on-site bistro and Scavolini Italian kitchens to The Selby, its luxury rental in Toronto. “The reason why we’re doing this now and not 5 or 10 years ago, is not that the cost to develop the building has gone down, it’s always been the same -- it’s rent that has caught up that makes it doable,” Gary Berman, CEO of Tricon, said in an interview with Bloomberg in May. GWL’s Livmore is out to attract millennials working or studying in the city and boomers looking to downscale. Adding a games room and a ‘Santa Day’ for pets are the little luxuries that help remove the stigma of renting. The company is also in negotiations to bring Los Angeles-based car-sharing platform Envoy to the building which will offer a fleet of electric vehicles, including a Tesla Model S and a Fiat 500e. It’s not clear whether rents can continue to increase at this pace with a wave of supply on the way. New rental development applications totaling 5,920 units were proposed in the second quarter, almost 3.5 times more than the same period last year. That brought proposed rentals to 37,403 units in 120 projects, the highest recorded by Urbanation since they began tracking in 2015. GWL isn’t worried about a potential glut. The extras the company is adding to its apartments will put it in good stead for the future, Nishimura said.